Jewish Facts From Portland: Where Can Syrians Find Refuge From Civil War? Syrians came into Egypt in 2011 at the beckoning of Morsi, who thought they would add votes to his Muslim Brotherhood. When he was deposed, the Egyptians were ready to send the Syrian refugees back to Syria, but could not according to the UN. Only some were registered as refugees at that point in time, then the deposed Morsi changed all that. Now, the government has reason to have them leave since they've been there past the original time allowed. Egypt has more than enough of their own poor to care for let alone refugees for they have a population of about 79,089,650. The American embassy is closed in Egypt so that Syrians cannot go there to get the needed visas to the USA. The embassies are situated in a war zone anyway where so much rioting has been taking place. There are curfews at night needed for protection. Egypt has not been the safe refuge they thought they were fleeing to. The American embassy was not even answering the phone to help these people when people were still there. Sweden has opened its doors to Syrian refugees, but the catch is that anyone with a Syrian passport has to have a visa to Sweden, and visas are going for around $5,000 or more. Even a visa to the USA for other people can go for as high as $2,000 for certain ones. After two years of being away from jobs, most Syrians have gone through their savings and are now penniless. They can't afford to get to Sweden. These people burdened with Syrian passports could go to many Muslim countries, like Turkey, but the problem again is the high costs of living. To go there they need money for rent and food, and jobs are not available, so they can't exist there unless they have family, which most all don't have. Obama said that the USA would take in about 2,000 refugees, but so far have only taken in 90 people since the start of the Civil War. 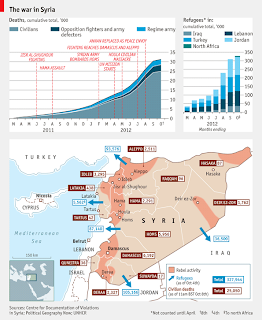 More than 2 million Syrians have left their homes in Syria. 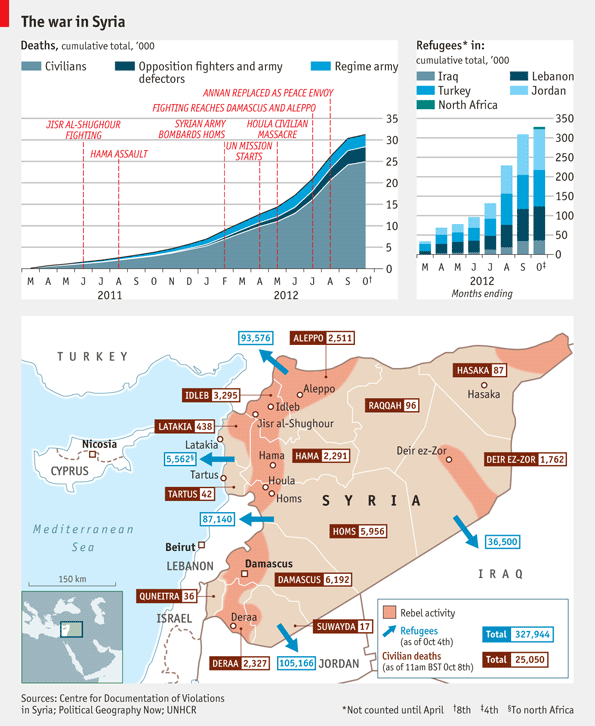 Syria's population before the war was about 22,505,000. Well over 100,000 have died in the war, more like 150,000 today. If one is an American friend of a Syrian wanting to come to the USA, he cannot sponsor the person. Even a mother cannot sponsor her children, especially a son. I found this out at the Lutheran Community Services, who seem to be the only ones who know about visas to the USA in our city. It would be easier today for the child to sponsor the parent. Political asylum isn't offered to Syrians, evidently. Only if the Syrian is a famous scientist or a former security guard at the US Embassy in Syria, can they have reason to get to immigrate to the USA. 50 people were granted refuge in 2013 to the USA and an embassy guard was one of them. In 2012 only 31 were allowed into the USA. He reported that he had been arrested many times and tortured for 10 days in Syria with the accusation that he was an agent of the USA. He's now living in Texas. Syria didn't need many reasons to imprison and torture someone who stepped over the line of acceptable behavior. Another reason was if you were even interested in joining the Masons, or if you were Jewish. The only recourse for Syrian refugees turns out to be Jordan's refugee camps with the UN sponsored Zaatari near the Syrian border in Mafrq, Jordan the most likely. There are camps sponsored by Jordan only that are far more dismal and in need of sponsors. People are not allowed to look for jobs if refugees in Jordan. It's a pretty dismal life. This is atrocious for people who have been industrious workers and not people used to being on the dole. It would be like expecting all of Portland, Oregon to suddenly live in a camp in tents or small boxlike structures in all sorts of weather and do nothing. Can you see problems arising? Of course. Most all Jews in Syria had left in 1992 and 1994 with the assistance of Judith Feld Carr. She is a Canadian that managed to take them out. That was quite a feat considering Jews were not allowed to go abroad and had been kept in a ghetto since 1948 living under unimaginable restrictions. Judith has been given awards from Canada and Israel for her bravery, determination and chutzpa. These are problems both Muslim and Christian Syrians and a few Jews are facing. Most of the refugee camps are full of women and children. The men are in smaller numbers. Men don't want to return to Syria because they will be forced to fight for either the state or the various terrorist groups. They truly have the reason to ask for political asylum, but are not being listened to or given this right. Not all the Syrian men want to join up with some group and fight. Who would want to stand by Assad? What kind of person would back him? Syrians had free education and free health care. As a president who is a dictator in reality, he did give his Muslim constituents that much. He was an evil man when it came to the Jews, however, who had lived in the Jewish Quarter in Damascus and in Aleppo, the hub of the business district. He had taken all their rights and they were actually locked up in a ghetto-like existence. The fear was that they would join Israel and fight against him, so the story goes.